who occupy the urban environment. The accessible platforms offered with Community Slate allows for a wide breadth of participation. in the changing landscape of their neighborhoods. structuring a conversation, not a forum. and city planners to ensure clear and consistent communication. 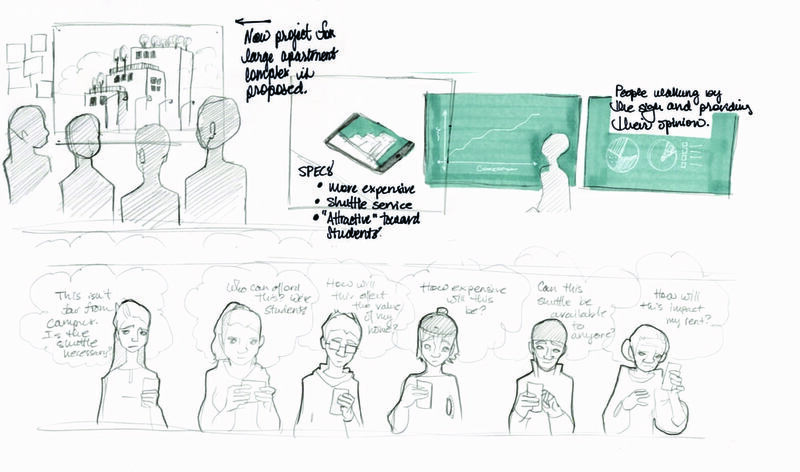 The movie storyboards illustrate the functionalities and utility of Community Slate through the perspective of the Urban Planner.These storyboards facilitated design iteration on the Community Slate forum pages for the mobile and desktop experience; the storyboards were also adopted into the design movie.